In parts one and two, of this five part series from our correspondent in New Jersey, we learned how she was first recruited into the World Mission Society Church of God, and how the pressure to spend more time at the organization slowly increased. In part three below, we’ll learn the blatant Biblical contradiction she discovered that led to her dramatic exit. We’ve taken the liberty of adding some relevant annotations between square brackets . Before my husband and I left for our honeymoon, the pastor advised us to pray during the service times and spend the Saturday that we would be away, reading a book written by Ahnsahnghong. My husband and I agreed and we were off on our way to Mexico. Little did I know, that would be the last vacation we would spend together. When we returned, the pressure to spend more time in the church increased even more. There was also a huge focus on “bearing ten talents” or recruiting. I remember going out with “sisters” to “preach” to new members. I had a sense that we were targeting people in their 20s and 30s since we never approached anyone that appeared to be older than that. We always went to crowded areas like stores and shopping malls. I was told that crowded areas were best and we would get to talk to the most people. I had a difficult time with this because I didn’t feel comfortable walking up to strangers and asking them if they had “ever heard about god the mother in the Bible”. The rejection from most people didn’t help. A lot of people would just walk away or tell us that they were atheists. Security asked us to leave after receiving complaints from customers. A few months before the wedding, one of my friends sent me an email that refuted the WMSCOG’s claim that Constantine abolished the Sabbath. This email had been bugging me for a few months and now that I had some time to think, I decided to do some research on the topic. I thought that it would be great to find some information that supported what I was taught during my first study about the Sabbath at the WMSCOG. I had trouble finding information in bookstores so I finally turned to the internet. I had avoided the internet after having heard that the internet was evil and considered by the WMSCOG to represent the modern day “tree of knowledge of good and evil” [more info on this]. A simple google search and I was lead to an article titled “Did Constantine Abolish The Sabbath In 321 AD?” [For our readers, she is referring to this article]. I was shocked to find out that Christians had been worshipping on Sunday long before Constantine was even born. So Constantine didn’t abolish the Sabbath did he? The WMSCOG’s studies that I thought were rock-solid seemed to be starting to crumble one at a time. This lead me to do a google search on the WMSCOG. To my surprise, I found a website that claimed that the WMSCOG was a cult! [The site is no longer online]. My anxiety levels continued to increase as I sat reading information about the contradictions in the WMSCOG doctrine, questionable practices, and former members’ stories about how they had been hurt by the WMSCOG. The most disturbing information that I had come across was that the WMSCOG was said to have been using the same mind control tactics used on US prisoners of war in N. Korea. I also learned about Robert J. Lifton’s thought reform model [more on this]. When I finally read an article that explained how the Jehovah’s Witnesses used the same tactics to control their members I could not ignore the similarities to what I had experienced in the WMSCOG. [For our readers, she is referring to this article]. I discussed the information that I had come across on the computer with my husband that evening after work. He was in his second day of a three day fast. I cannot recall the occasion for the fast, but fasting at the WMSCOG means no food or water. Participation in the fast is expected from all members including children and infants. I remember hearing a “sister” explaining “my baby needs salvation too”. I found this outrageous so I refused to participate. It was a Tuesday evening so we were scheduled to attend the 3rd day service. After confronting my husband with the information that I found on the internet, he was shocked too. He admitted that we had been fooled and wondered why an organization would take advantage of people like this. He said that he felt “lost” and didn’t know where to go now. He was starving so we went to dinner and decided not to attend the service that evening. The WMSCOG takes attendance during services so it was soon obvious that we did not show up. We were both contacted that evening regarding our absence and I remember replying something to the effect that I had found some information on the internet that caused me to consider whether or not we would be returning. We were encouraged to attend a meeting with the pastor where all of our questions about the information on the internet would be answered. We were assured that the negative information on the internet was all lies. My husband and I went to the WMSCOG a few days later to meet with the pastor. When we arrived in his office there were three other WMSCOG members present (a deacon, a deaconess, and another male member). The meeting started with an explanation of how people persecute the WMSCOG on the internet by spreading lies about “father and mother”. I was assured that all of my questions would be answered. I remember asking the pastor why members in the WMSCOG had separated from their non-believing spouses. After all, the girl who recruited me had just left her husband because he decided to stop attending the church. I pointed out how in 1 Corinthians 7, the apostle Paul states that married members of the church should not separate from their non-believing spouses. The pastor explained that the church does not encourage divorce, but instead encourages married couples to stay together. So again I asked, if this is true then why are there so many divorced or separated members? He explained that the members had no choice but to leave their spouses because of the persecution they received. He went on to explain that the non-believing spouses usually had a problem with how much time the member spent in the church and usually would end up trying to make the member choose between the church and the marriage. The deaconess sitting to my right went on to explain that she divorced her husband due to similar circumstances and that her husband had also committed adultery. It is important to point out that she had never once mentioned that her husband had committed adultery to me before. The other times that she had discussed leaving her husband with me, her reasons were that he had tried to stop her from tithing and attending the church as often. I thought, how convenient. I was determined to find out the truth about this alleged “mistranslation”. A few days later, I asked my husband to drive me to a nearby town where many Korean folks live. I know it sounds crazy but I had to know. I approached random Korean people on the street and asked what the underlined word (중에) meant. Some just pretended that they didn’t speak English probably because they thought I was trying to recruit them. Some didn’t know enough English to tell me what the word meant. Some were too Americanized and didn’t know enough Korean to read the word and tell me what it meant. I was becoming frustrated because it was around midnight at this point and I still hadn’t found anyone to help me with the translation. I had just about given up when I found a couple in a diner that was willing to talk to me after I started the conversation with “I’m not trying to preach to you, I just need to know what this Korean word means in English”. The gentleman that was willing to look at the book told me that the underlined word (중에) meant “during” and not “middle”. He also pointed to a word in the next line that said “every day” (날마다). That meant that there was no error in the translation! 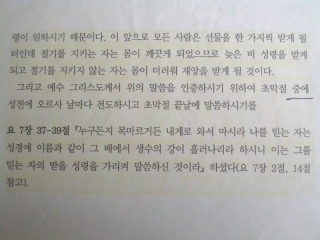 Ahnsahnghong really did write that Jesus preached every day during the feast. I was completely shocked!!! That meant that the pastor lied to me. I couldn’t believe that he would lie to me just to placate me. When I told my husband what the Korean man in the diner said, he was less than moved. I couldn’t understand why this seemed not to bother my husband. 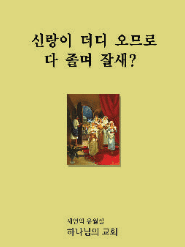 My husband ignored the blatant contradiction between Ahnsahnghong’s book and the Bible, and continued to attend. [For our readers, there are many more contradictions between the writings of Ahnsahnghong and the Bible listed here] . Despite confirmation of the translation with Google, my husband was somehow convinced by a WMSCOG missionary that the word did in fact mean “during”. I remember even asking one of the Korean “sisters” what the underlined word meant as I was in line to use the bathroom. She also told me that the word (중에) meant “during”. Some time later my husband eventually admitted that the pastor did in fact lie to me, but excused his actions. According to my husband, the pastor lied to me in an attempt to “save” me. 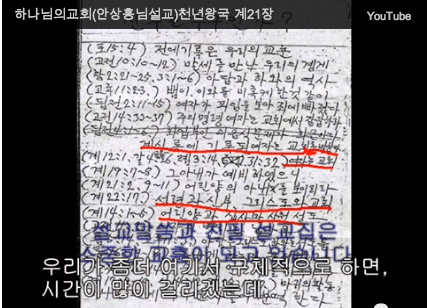 I don’t understand why, but he continued to ignore the contradiction between Ahnsahnghong’s statement and the Bible. 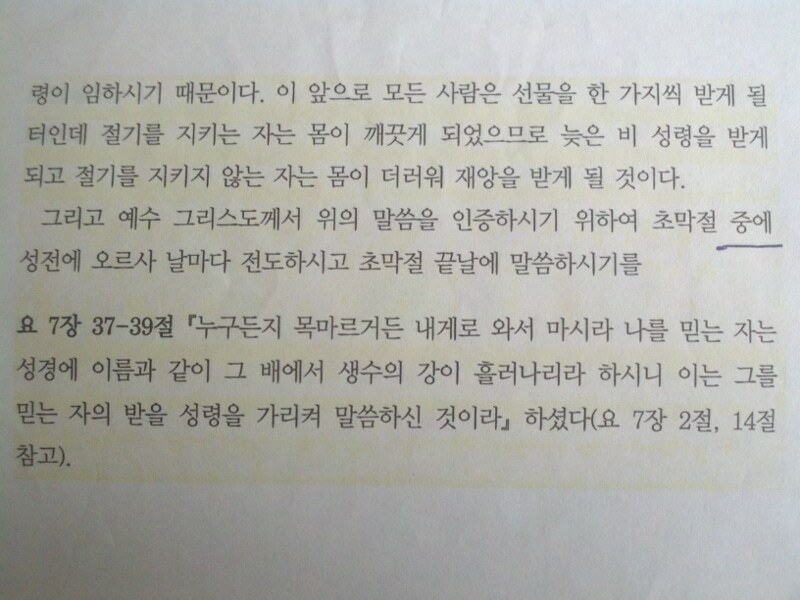 I asked my husband why the pastor would point to Ahnsahnghong’s writings and lie if the pastor believed that those words were written by “god”. Would he point to the Bible and do the same? When did Jesus or any of his apostles lie to someone in an attempt to save them? Never. The last service that I attended at the WMSCOG after this incident was a reality check for me. First, I was made to sit next to my husband, which is a big no-no in the WMSCOG. I was later told by a deaconess that “sometimes married couples sit together” though I had not observed this in the past year of my membership. Then toward the end of the service the pastor mentioned that it was only acceptable for new members who hadn’t finished their studies to ask questions about contradictions they read on the internet. According to the pastor, if the member asked questions after having completed the basic studies, it was “stupid”. I thought, wait a minute, didn’t he just tell me a few days ago that I could come to him with any questions that I had and that they would be answered. Why would the pastor encourage me to ask questions and then call me “stupid” for doing exactly what he encouraged me to, in front of the whole congregation a few days later? Was this an attempt to humiliate me? My husband later admitted to me that the seating arrangement had been made prior to my arrival in an attempt to keep me from “contaminating other sisters” with my doubts. So the deaconess lied to me too? At this point I felt manipulated and I had had enough of the lies and secrecy. I would not be returning to the WMSCOG. I wondered, and worried, what it would be like now that I had decided not to return to the WMSCOG and my husband had decided to remain a member. Wow. We have no further comments. She said it all. What an incredible story of her dramatic exit from the WMSCOG. Can you believe what happened in that last service she attended? The audacity and rudeness is almost unbelievable. How people stay in this group is mind boggling. If you thought part 3 above was bad, wait until you read part 4 when the WMSCOG attempts to make her sign a document saying she can not talk about her experience. What is with these people? We’re sure glad she didn’t sign it, otherwise she wouldn’t have been able to share her experience with the rest of the community here at www.examiningthewmscog.com. Man this story is getting good!she should write a book. Contact ABC news, might of fact. Im going to look into this. Have anyone ever tried to do so with abc, nbc, cbs, 60 minutes or something? This is very upsetting. Unfortunately most of the network don’t seem to want to poke this hornets nest. There have been reporters that have done research and were prepared to move on this story only to have it shut down by their editors, networks, and/or lawers. It’s frustrating because it really is a story that needs to be told. Wow, I just visited this church recently, and I found it strange. From the seating arrangements, to the ABUNDANCE of God bless you’s (love bombing), to the persistent requests to return. I’m so glad I came upon this site. Glad you found this site as well! Please spread the word about this group. It is easy for people to see through it if they have the information before they are approached. Once entrapped it is a different story. GOD BLESS YOU!!!! I had a deacon lie to me too!! When they started to teach me about how to pray to mother and father, deep down I thought God please forgive me if this is wrong. Whoever made this website GOD BLESS YOU and let’s follow jesus the true God in flesh. Mr Ramos or whoever the admin is,thank you for all your time and effort in developing the actual truth. God bless you. Lets follow jesus and go to heaven. Theological ignorant and exploitation for one’s self glorification is at work. The Bible was a Canonical book; there were many books existed after the death of Jesus. Constantine organized the council of Nicea to pick and choose books that should be included in the Bible today (Divinity Vs. Humanity, or Grace Vs. good deeds). The entire Judea-Christian tradition also (B.C period) has rooted with Sumerian culture, and that is another debate issue. The Moon organization had rooted from N.Korea with the same claim of revelation and interpretation of the Bible to suit their agenda of Korean version of the Bible that concluded Mr.& Mrs. Moon as True parents of mankind. Now, we have a “Heavenly mother”? Just wondering if these two were connected back to early days of N.Korea that many claimed themselves divine of super special as dictator Kim? The pattern of religious cult: Overwhelm with love and attention during initial contact and hooking a victim with certain logic (e.g people are basic good, but the world is bad/ Society is greater cause than individual….Jesus said to leave thy parents to follow him!…). The next stage is indoctrination through various means to replace victim’s individual identity with group identity. All done, victims are their minions (followers/ members with rank). You can seek God without middleman, and God speaks universal language- not Korean. Wake up minions before too late. If you want to go to heaven, please take heaven with you; for you are creating heaven or hell everyday. MAY THE FORCE (GOODNESS) Be WITH YOU. I am visiting Korea this summer and I was approached by a lady at a crosswalk while I was walking through Gangnam to find K-pop entertainment buildings, and let’s just say I let her bring me to her “Zion” because I was lowkey board. They started explaining the Bible to me from a new prospective and I a bit awestruck. Then they started telling me about Jesus having already returned. Then they told me that I needed to be baptized in Christ “new name”. And like an idiot I let them. I regret it so much. I’m only 19 and I’m here in Korea alone which I think made me seem like an easy target. But, little did they know that even though I may seem young and naive I have a pretty deep relationship with the ONE and only TRUE GOD. After the baptism I was still praying in Jesus Christ name because I didn’t know I was supposed to be praying in Ahnsonghong and heavenly mother’s names. But I prayed for God to open my heart and eyes to the truth that day. I continued to pray after that day this prayer for about the last 2 weeks because honestly I felt really confused so I kept asking God for wisdom. And God came through this past Tuesday. It was after the 3rd day service that I was curious and wanted to know more so I simply googled the church because I was aware that they had a website. I was going to read about my next “lesson” and I ended up reading their whole wikipage and Ahnsonghong’s wikipage. That’s when I realized that I was being brainwashed and lied to. The fact that this “church” even dares to go against the teachings of the one who they believe is the 2nd coming of Christ. I feel absolute disgust towards the fact that they were really trying to brainwash me, and I was unaware but I was allowing it to happen. But I truly believe that Jesus was the perfect sacrifice, so there is no need for a 3rd day service to cleanse ourselves of our sins.Also we are saved by grace, which is a free gift so all this community service is nice but it doesn’t get us to heaven. But boy, they really be trying to recruit people. I’m from the US. I can read Korean but I understand very little. So during services they would give me a device with an earpiece so that I could have a live translation of the sermon while I am sitting in the pew. There would be a member in a room during the services speaking into a speaker interpreting the Korean so that I could understand it. But anyway I need advice for how to get out of my current situation? I just can’t believe that I was almost pulled away from God to worship a false God. I never remembered their prayer of wishes anyways. But I refuse to pray in false Gods names. I literally broke into tears after I realized what was happening to me. I feel so uncomfortable there now.